Enterprises that embark on accelerating ERP testing via test automation, often encounter poor test automation framework, a high cost of tool licenses, lack of skilled test automation resources with ERP knowledge. Cigniti’s ERP Test Accelerator ensures acceleration of ERP testing and reduces the overall testing time, cost, and risk for the enterprises. Cigniti ERP Test Accelerator supports a wide range of ERP packages including SAP and PeopleSoft. Cigniti’s ERP testing services are designed to ensure rapid and comprehensive results via its ERP Test Accelerator to reduce the overall testing time, cost, and risk. 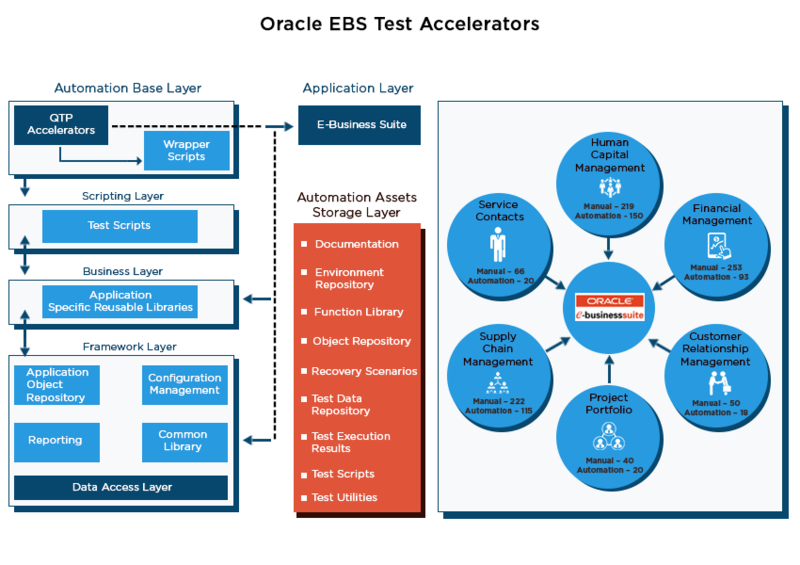 The ERP Test Accelerator Kit contains ready-to-use manual and test automation assets to accelerate testing for a wide range of ERP packages that include Oracle EBS, Workday, Microsoft Dynamics, and SAP etc. These help accelerate testing effort and provide a faster ROI. Cigniti’s ERP testing approach consists of a modular framework and pre-built test assets. Our CRM test accelerator is a vast repository of pre-built test cases, use cases, and business scenarios. All the knowledge captured in the form of test assets saves total cost, time and efforts of testing. The pre-designed test assets are automated and reused in multiple business process tests. Research report indicates that over 10% of the Enterprises do not reap full benefits of ERP implementations. Enterprises report various failures and challenges throughout the ERP implementation life cycle (from Blueprint to the implementation phase, including Upgrades). It is also evident that ERP projects often exceed budgeted time and cost. Cigniti’s comprehensive ERP Test accelerator ensures desired business outcomes and rigorous testing of every business process and critical process flows for ERP testing. With test effort coupled with strong functional and domain understanding, Cigniti ensures comprehensive coverage of all test scenarios. Cigniti leverages its deep expertise in leading Commercial tools to help clients optimize the costs and time on testing the ERP systems. Cigniti offers ERP testing services that are designed to ensure rapid and comprehensive results via its ERP Test Accelerator to reduce the overall testing time, cost, and risk. Cigniti ERP Test Accelerator supports a wide range of ERP packages including SAP and PeopleSoft. Download our ERP Test Automation Case study to know how we helped a Leading Law Firm in US. Cigniti’s SAP testing approach consists of a modular framework and pre-built test assets. 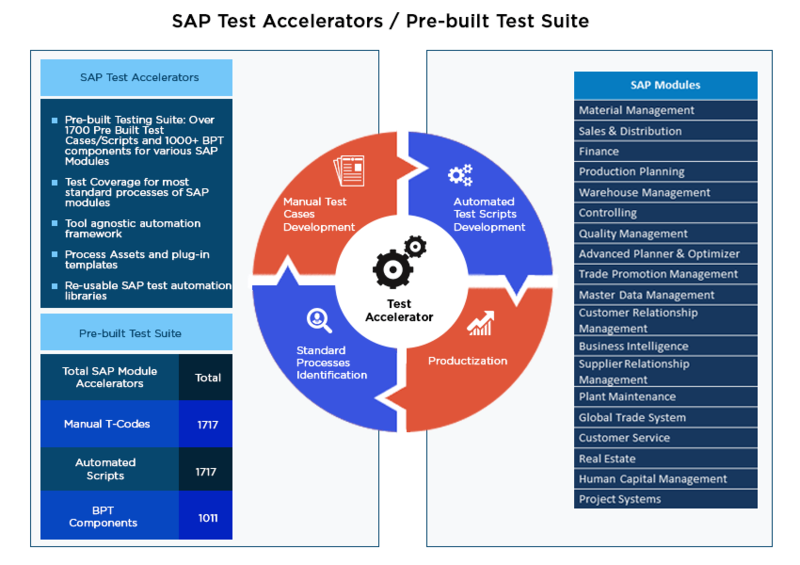 Our SAP test accelerator is a vast repository with over 1700 pre-built test cases, use cases, and over 1000 BPT components. All the knowledge captured in the form of test assets saves total cost, time and efforts of testing. The pre-designed test assets are automated and reused in multiple business process tests. Cigniti’s Oracle CoE test experts have worked with multiple Oracle test engagements and with this expertise they have developed pre-built manual and automated test suite that has been refined over the years. 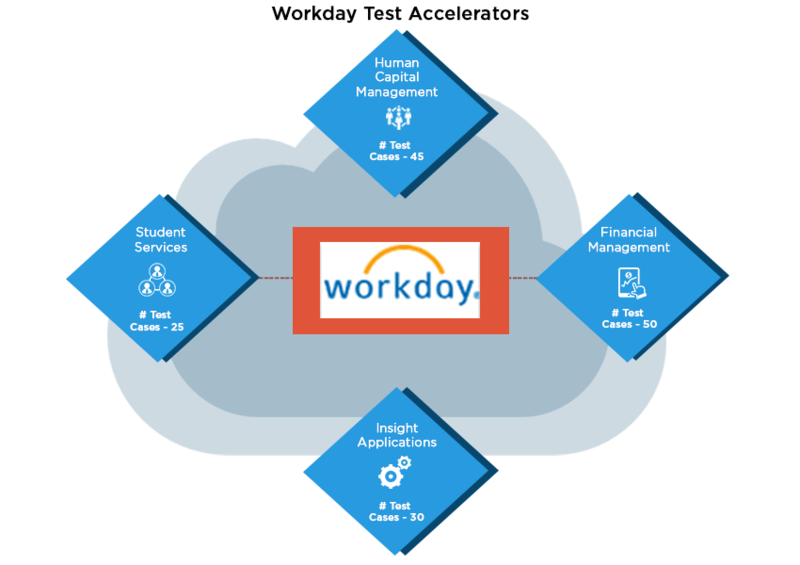 One of the major challenges in Workday Testing is understanding complex requirements related to Business Process with their integrations with Upstream / Downstream third party applications and converting them to end-to-end test scenarios for 100% Test Coverage. Also, managing Workday updates with many vital features, which is released in shorter timelines, requires robust regression testing methodology in place to complete in very shorter window timeframes. Cigniti’s Workday testing experts with unmatched testing experience on Workday, has developed the pre-built manual and automated test suite with their experience across several engagements. PeopleSoft applications, which your business relies on, cannot deliver value if you face issues such as functionality issues that cost production outages, changes & upgrades without thorough testing, test creation and maintenance that cost much time and resources, test T-codes with fewer sets of data than that production uses, etc. Cigniti’s PeopleSoft Test Accelerator enables you to address all of these challenges and helps you to maximize returns from your application investments by making comprehensive automated testing faster to implement, easier to manage, and cost-effective to maintain. 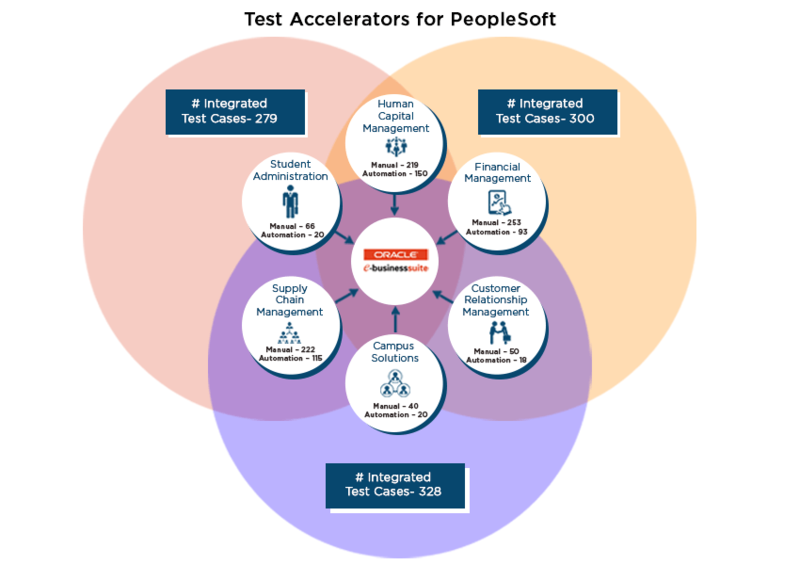 Cigniti’s PeopleSoft test accelerator includes manual test cases and fully automated test scripts, designed to be business-centric and extensible for your unique PeopleSoft environment. Cigniti has forged strategic partnerships with various Testing tool vendors which help us offer additional value to our clients. Our partnerships with tool vendors like AppDynamics, HP, Smartbear, Neotys provides customer the option to choose the right tool based on their requirement and budget. Cigniti has executed many ERP testing engagements for SAP, Oracle, and other ERP packages and has a dedicated ERP Testing Center of Excellence to offer customized ERP testing solutions to our clients. We not only understand the needs of our clients but of their customers as well. Below is the partial list of our clients who trust us for their ERP testing needs. ERP is no longer a cut-and-dried decision between either an ERP suite or a set of best of-breed applications. Instead, more and more firms will find themselves making hybrid investments in a mix of on-premises, hosted, and SaaS ERP deployments for their global operations, with a core suite complemented by components from a partner ecosystem.